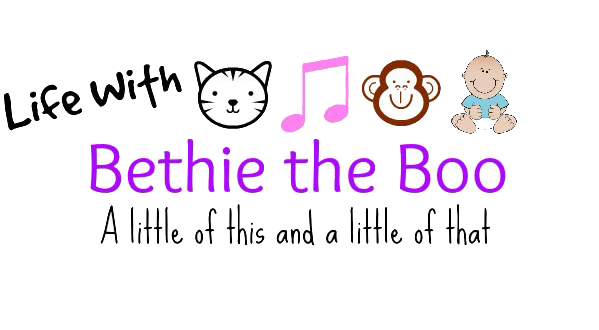 Life with Bethie the Boo: Hey you guyyyyys! It's SPRING! Finally! I'm wearing sandals! Finally! I believe this is the latest I've ever gone into the year without wearing them, it's crazy! 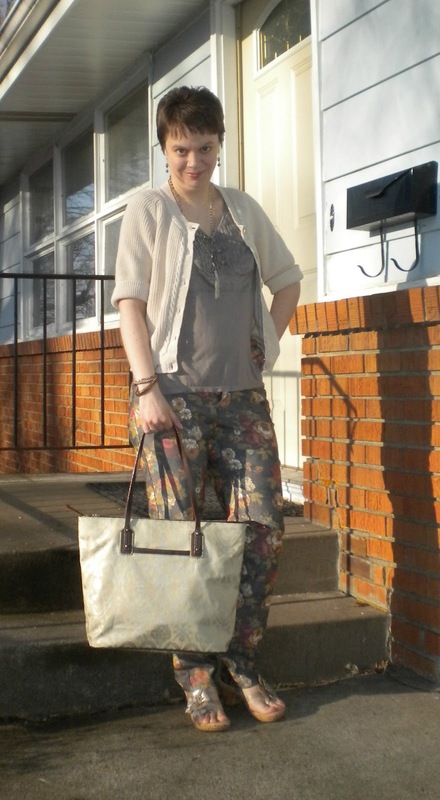 Anyway, today's post is picture heavy as I celebrate all the wonderful things about spring: floral, sandals, arm parties, light colored bags. I did wear these pants even through the winter as they seemed to work for year round, but I'm excited to wear them in the spring and summer, they have so many style options! And I'm weak. Yes, this is a new bag. Yes I'm still on a shopping ban. 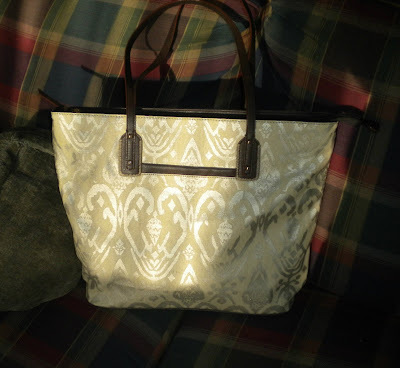 My sister-in-law's best friend (aka my Stella and Dot enabler) had a S&D open house last weekend to showcase the new spring/summer line and I fell in love with this tote. I've had a rough month so I decided to treat myself. It's a bit bigger than what I've been used to carrying, but I just love the color and it's surprisingly lightweight, so I think it's going to be a great spring/summer bag. Clearly I need a pedicure, very, VERY badly, but I'm just so excited to wear sandals anyway!! Happy feet! I took a close up of my arm part, it turned out a little blurry. 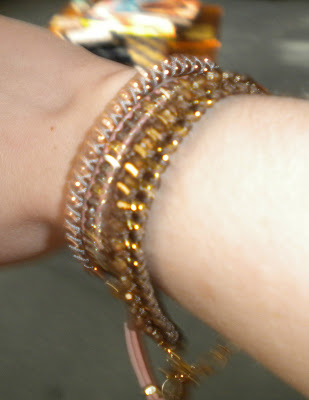 I'm really excited to wear bracelets again. I just don't see the point in the winter when long sleeves cover them up! And of course, I had to give you a close up of the bag. It's a nice material that wipes clean. I should have showed you the inside, it's a fun red print. It has one outside pocket that is perfect for my cell phone. And it just feels classy. I'm getting to the time of the year where I'm going to start changing bags more frequently because I often match them to my outfits, I can't help it in the summer for some reason, but I do expect to get a lot of use out of this guy! Welcome Spring, welcome. Please stay as long as you like, we're so happy you're here! That is a lovely bag. 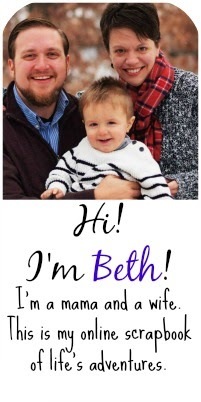 Happy to hear spring has hit you, Beth! SANDAL WEATHER! I busted my sandals out too, and I'm not wearing them with tights or socks now either! hurray! i love the little flower detail on them. So cute! 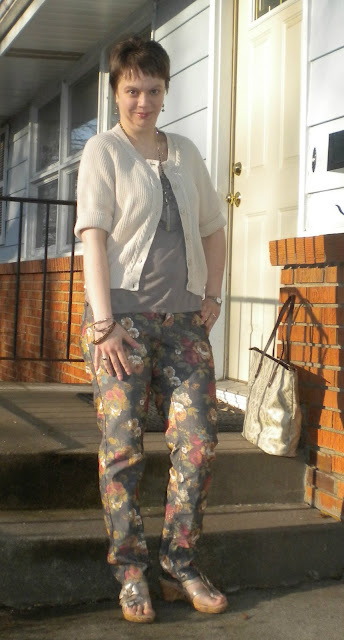 YAaaay floral pant day! 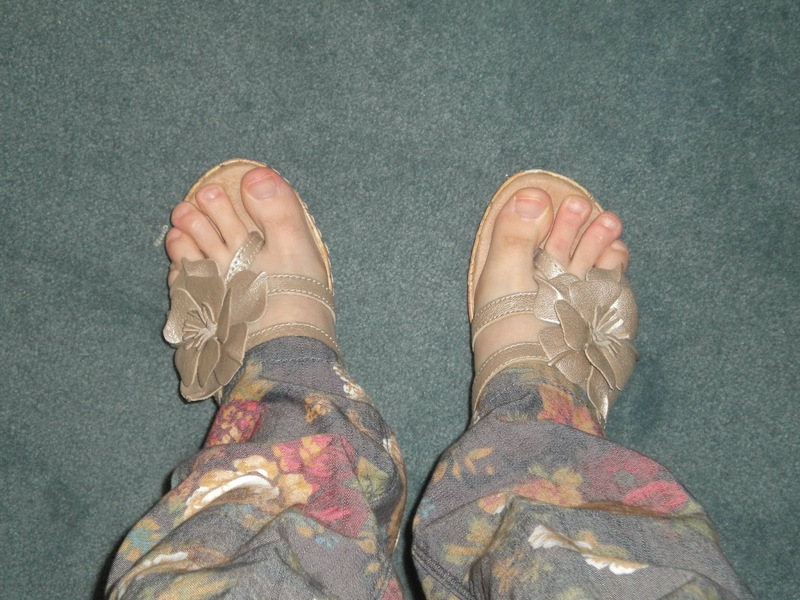 I also wore floral pants and sandals, although my weather was highly inappropriate for it. Brr! Cold feet. Also hooray for new bags. That one has a great print. yay!!!!!! i haven't been outside since this morning, but i plan on opening a few windows this weekend!!! love your new bag! I love your Floral Pants, very trendy for now & the color of yours is so unique. Love the sandals too. I really do adore the purse & necklace though. 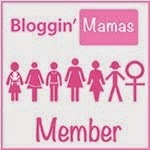 I hope you will participate in my Birthday Blog Party where you style and E-Mail an outfit to me. 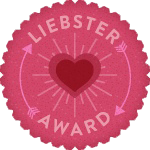 You can find my EMail in one of my recent Birthday Posts. What a Springy post. Love the bag. Yay for spring! That bag will be perfect for this spring and color, and the neutral color means it can match pretty much anything!